Served on the boardwalks of Atlantic beaches, these simple fries are a taste of summer. Peanut oil and Old Bay. It’s no coincidence that these are not just the defining components of proper beach fries, but the iconic aromas of any Atlantic boardwalk. 1. Peel the potatoes. Using a knife with a sharp blade or a fry cutter, cut them into lengths a little less than 1/2 inch square. Place the cut potatoes in a large bowl filled with cold water. Add the vinegar and swirl the potatoes around. Place the bowl in the refrigerator for at least 1 hour. 2. Swirl the potatoes again and drain the water. Spread the potatoes on a layer of paper towels and pat dry with additional paper towels. 3. In a large heavy pot or deep-fryer, preheat the peanut oil to 315°F (157°C). Line a baking sheet with paper towels. 5. When you are ready to serve the fries, reheat the oil to 375°F (190°C) and fry for about 4 minutes, until crispy and golden. (If using frozen potatoes, allow them to thaw at room temperature. Pat dry before frying.) Remove the fries from the fryer to remove excess oil. Spread on paper towels. 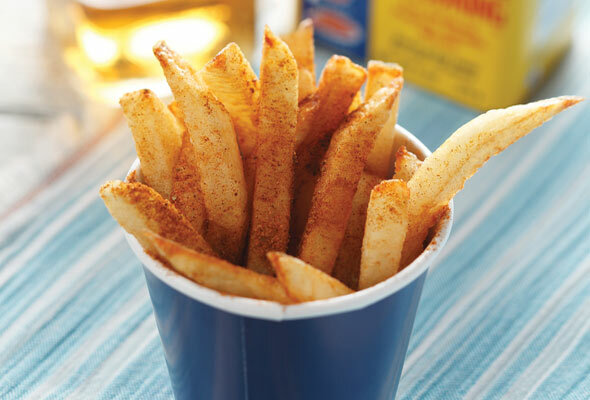 Allow the fries to stand for 1 minute before sprinkling them with Old Bay. Serve them hot, preferably in a paper cup, dousing them liberally with vinegar, if desired. 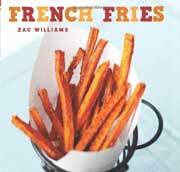 Beach Fries Recipe © 2011 Zac Williams. Photo © 2011 Zac Williams. All rights reserved. All recipes and photos used with permission of the publisher. These were amazing. I used a small amount of vinegar but that’s because I enjoy the taste of vinegar with fries. I know there are a great deal of people who do not. The Old Bay added such a nice flavor rather than just salt and pepper. A perfect snack or a perfect addition to a steak off the grill. You know something is really, really good when it doesn’t even make it to a plate. As I was seasoning the last batch of fries out of the fryer with Old Bay and vinegar my husband walked in. What happened next went something like this: “Hi Sweetie, I just finished making these fries. Want to give them a try and let me know what you think?” We proceeded to taste one, followed by nods of approval to one another. We tasted a few more, and the nods began to quicken. Before we knew it, we had shared three potatoes worth of Beach Fries. I can best describe these as a potato chip on the outside and a fluffy baked potato on the inside. I LOVE finding a recipe that becomes my standard way of preparing a dish. This is the only way to make french-fried potatoes—with or without the Old Bay. I know exactly what you mean about not making it to the plate, Jo Ann. That was my and my husband’s reaction to the Momofuku Fried Chicken. Exactly the same response. Sigh. So good. I haven’t made this, yet, but I will. Thank you, thank you, thank you! Beach fries are the gold standard, for me. What does the vinegar in the soaking water do? I often season the finished fries with malt vinegar but never thought to use any vinegar in the soaking water. Soaking the fries in a vinegar water solution helps them to get nice and crispy….yum! I did a whole blog post about how to make Thrasher’s French Fries–the Ocean City, MD, beach fries. They serve them with vinegar only! A lot of thought went it to getting these crispy, but I never tried actually refrigerating the fries after the first fry. I’ll try that next time! They also serve with salt at the ones I’ve been to. Old Bay is also good on fresh sweet corn, coleslaw, peas, potato, and macaroni salad, etc. Some people may be unfamiliar with beach fries. Thanks for sharing your recipe for them. You’re so very welcome, Perfect Fries! It’s our pleasure. Mmmm…peanut oil…. I had never heard of Beach Fries until Dan posted this recipe on What’s for Dinner. I fried some up for last night’s dinner and we loved them! The Old Bay Seasoning is genius! Old Bay is sooo lovely with fries, isn’t it? So glad to hear you liked ’em as much as we do, Susan. Has anybody tried to make these baked? The frying in peanut oil is what really gives them that special beach (boardwalk) fry flavor. I just tried using fresh potatoes with potato cutter unfortunately I could not get my hands on a large container of the peanut oil I was stuck using Wesson I can say not as good but I am going to get the peanut oil in a couple weeks and do it again hopefully it will taste better this time. teddy, I think you’ll find that peanut oil makes all the difference!